SEJONG -- Job creation has been one of the top administrative priorities of the Moon Jae-in government, which took office 20 months ago. 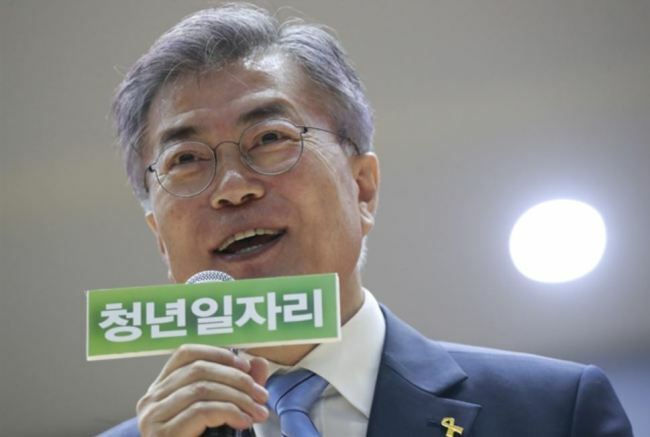 A large portion of people are thought to have voted for Moon because of his electoral pledges, thinking that he would improve employment conditions. And many Koreans downplayed the hiring statistics for 2017, when Moon became president. But the bearish job market has continued through 2018. Data from Statistics Korea unveiled in January showed little improvement in the nation’s employment sector. Earlier this month, the Organization for Economic Cooperation and Development released a report on unemployment rates, which showed comparison of the 29 nations, including South Korea, out of its total 36 members. The 29 OECD countries saw their collective jobless rate fall by 0.5 percentage point from 5.8 percent in 2017 to 5.3 percent last year. It was 6.3 percent in 2016. The US and Japan posted rates of 3.9 percent and 2.4 percent, respectively, in 2018, an apparent improvement in hiring compared to 4.4 percent and 2.8 percent a year earlier. All of the OECD members from Europe, North America and Oceania recorded a drop in jobless rates on-year. They included the Czech Republic, Germany, Ireland, Italy, Latvia, Lithuania, Mexico, New Zealand, Poland, Portugal, Slovak Republic, Slovenia and Sweden. In contrast, South Korea posted a 0.1 percentage point on-year increase in the unemployment rate to 3.8 percent in 2018. Chile was the only other of the 29 members to record an increase. The 2016 and 2017 figures for Korea were both 3.7 percent. This is quite comparable to the US, whose jobless rate dropped by 1 percentage point in two years from 4.9 percent in 2016. Further, Poland and the Netherlands saw their rates plunge from 6.2 percent and 6 percent, respectively, to 3.8 percent over the corresponding two-year period. By gender, the rate was 3.7 percent for Korean women and 3.9 percent for men. 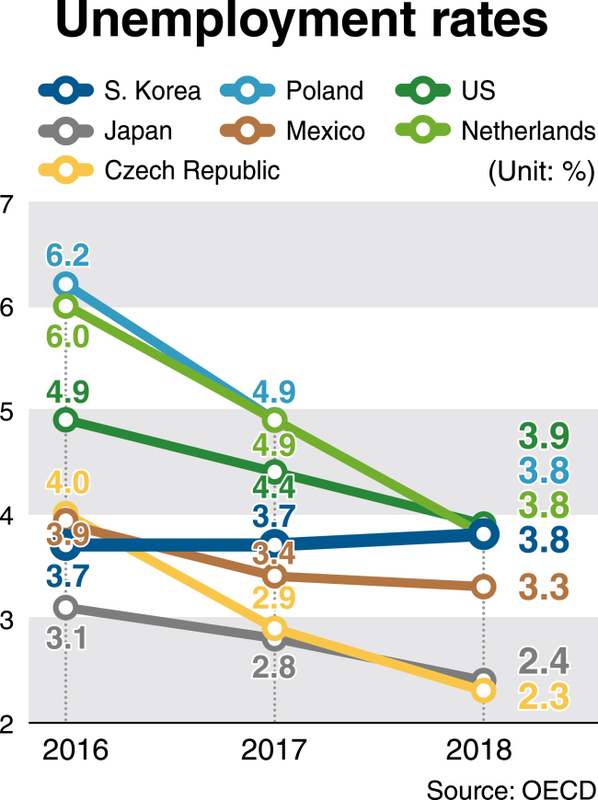 South Korea’s youth unemployment rate was higher than that of the US, Japan and Mexico. The OECD cited figures for the economically active aged from 15 to 24, which indicates age range between about 17 and 26 in South Korea. South Korea posted 10.5 percent in youth jobless rate last year. It was 8.6 percent in the US, 6.9 percent in Mexico and 3.7 percent in Japan. More specific data from Statistics Korea showed the seriousness. The number of unemployed increased by about 50,000, or 4.9 percent, on-year to reach 1.073 million at the end of 2018, which is the highest since 1999. About 630,000 Korean men and 443,000 women were found to be in the state of being out of work. By generation, Koreans in their 40s recorded a 0.4 percentage point increase and 50s 0.3 percentage point in the jobless rate. Further, a fall in the number of employed in their 40s is the first time in 27 years. Kim Yeong-dae, former research fellow of the Korea Research Institute for Vocational Education & Training cited “a worrisome point” that the number of newly employed in 2018 stayed at the lowest in nine years, in his contribution to a recruitment-oriented journal. He also said the drastic hike in the statutory minimum wage dealt a severe blow to the sectors such as wholesale, retail, lodging and restaurants. A TV documentary program on social affairs cited data from a private research institute, which claimed that the real sentiment-reflected unemployment rate in South Korea had reached 11.8 percent, which far surpasses 3.8 percent for 2018 calculation by the government agency. It also argued that the real sentiment-reflected jobless rate among the youth came to 23.3 percent early this year.